The La Serna defense got the stop when they needed it. 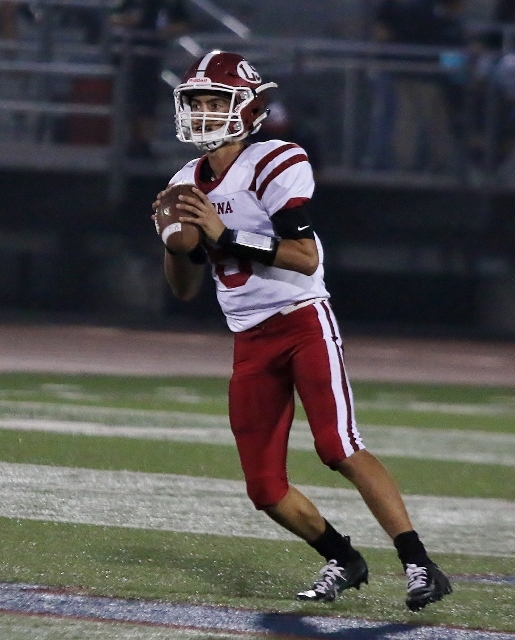 (Ontario) With the warm smell of livestock rising up through the air, the La Serna Lancers rode into Ontario Friday night to take on the Colony Titans. Andrew Henriquez’s third touchdown pass of the night to Abraham Shalash help to lift the Lancers past the Titans 37-30. With the game tied at 30 with 9:20 left to play, La Serna went on a 16-play 60 yard scoring drive that ate up over six minutes in the final frame. Henriquez found Shalash from 3-yards away to cap the drive. Chandler McCaffer booted through the extra point for the seven point lead. A lead the Lancers wouldn’t relinquish. Colony got on the board first taking their opening drive 75-yards on six plays with Joseph Tesimale finding Christian Hill in the endzone from 28-yards away. The Titans lined up for a two-point conversion but were turned away by the Lancer defense. It would be a familiar sight on the night as Colony failed to convert on all five two-point conversions. 3 touchdown night for Andrew Henriquez. La Serna answered the score with one of their own using a 10-plays to go 75 yards with Henriquez connecting with Shalash on their first touchdown of the night. With McCaffer’s extra point the Lancers took the 7-6 lead. Colony took the lead right back on the ensuing possesion when Elijah Monroe got loose and went 52-yards to paydirt. The Lancers took a two score lead on back-to-back touchdowns by Shalash on a 27-yard pass from Henriquez and a seven yard run by Nikolas Otero. La Serna went for two after each touchdown and were succesful to push the lead to 23-12 with 9:52 left in the first half. La Serna extended their lead to 30-12 three minutes later on a six yard run by Otero. Otero finished the night with 110-yards on 17 carries and the two scores. Colony came back with two touchdowns of their own on runs of 46 and 40 yards by Tesimale and Monroe respectively and the Titans trailed by just six heading into the lockerooms at the half. The third quarter was fairly uneventful as neither team gained enough traction to get into the endzone. With 9:20 left to play, the Titans manged to tie the score at 30 when Monroe got his third score on a 1-yard run. Monore had a solid effort for Colony gaining 218 yards on 24 carries with the three scores. On the ensuing drive with the score tied, La Serna went on their 16 play march to glory. Colony did get the ball back with just under three minutes to play but on fourth and seven from the Lancer 47, Tesimales pass fell incomplete and La Serna ran out the clock. Henriquez was efficient on the night hitting on 13 of 16 passes for 149 yards and 3 td’s. His favorite target was Shalash who hauled in 5 for 53 yards and all three td’s. 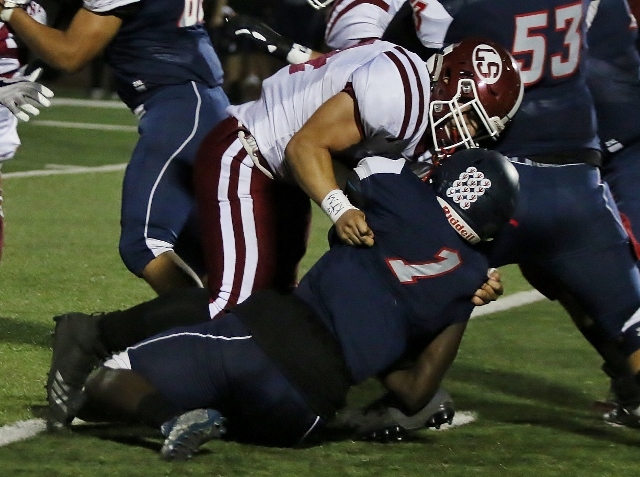 16 Comments to "La Serna Holds On To Beat Colony"
– Good teams find a way to win! Im not sorry for drinking the look aid in Whittier…it is what it is! …LS is working hard everyday. Nothing wrong with that. Best of luck to all teams and rivals. Hahaha thanks Sword I needed that laugh on a Monday. You needed double OT to beat Los Altos. LS would beat you by 3 scores, minimum! Easy there sword. You don’t want to come out swinging, thinking you are sharp, only to find out you are just dull and rusted. Hope they each make it to the postseason and get to face each other. Then after the game you can make whatever claim you want. Nah, La Habra is on another level, which is why they are a few divisions higher. @ Maverick: Easy Big Guy! That was a few years ago in a division that was probably equivalent to Division 7. Just allow the talent and the season play itself out. Sounds like you have a close connection to LS. Keep humble. It’s just better that way. @ “?”: No way is LS the “bully on the block”. That still belongs La Habra. Just wait til league play begins. They’ve been competing with the big boys this preseason. The Highlanders will destroy every team in that league. And they should considering much of their talent on the field has been brought in from outside the La Habra area. SPHS may be the other bully in the making. @ Sword: RELAX…….Your once storied program hasn’t seen a glimpse of glory since Pete Gonzalez (current Montebello coach) was there. He did the same thing back then also, recruit, recruit, recruit (transfers). He had a large group of transfers during his Championship run. That too was in a much lesser division. You and Maverick may want to both share a piece of Humble Pie. A bunch of football still to be played folks. Can’t wait to catch some more local games. Best wishes to all….stay healthy, have fun and keep humble. We would smash La Serna, they don’t even belong on the same field as St Paul. Is La Serna replacing La Habra as the bully on the block.? When teams see La Serna they say we’re small, but they don’t understand it’s a team game and speed kills! I don’t want to bring up the past, but do you guys remember CIF Championship in 13. LS vs Norwalk with Rashaad Penny (Yes the star at SDSU and now with the Seattle Seahawks) Norwalk’s offensive line was huge and they were rolling everybody. Penny had a few big plays but he was banged up by LS’s D and was not the same. LS showed them the heart of a Champion. One whiff of the air at this school, and you know the real game is to see which squad can inhale the particulates of fresh cow dung at the rate required by athletic performance—and remain conscious. It’s always a game of elimination, namely the effort to deal with what has been eliminated. As a local guy from the Whittier-Santa Fe Springs area, it’ll be interesting to see how things play out in post season play. If both teams get into the playoffs, I hope CIF places St. Paul & LS on opposite ends of the Div 5 bracket. It’ll make for a nice backyard brawl.